Pennsylvania’s conservation districts were established in 1945 when the General Assembly passed the Soil Conservation District Act, Act 217 of the General Assembly commonly known as the Conservation District Law. For over 55 years the state’s 66 conservation districts have served as leaders, addressing local natural resource concerns at the county level. The county conservation districts work to help people and communities take care of the natural resources in their area including soil, water, wildlife, trees and other plants. Using natural resources wisely helps to insure their availability well into the future. Conservation districts were initially established to promote the value of conserving soil and water to farmers. Today’s districts have evolved; their areas of interest and expertise involve almost every area of natural resource conservation imaginable. 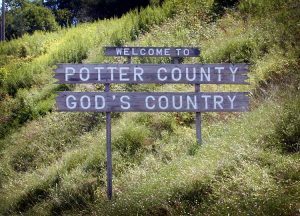 The Potter County Conservation District was declared a District by the Board of County Commissioners on November 28th, 1945 and became the Commonwealth’s first Conservation District. Today, the Potter County Conservation District is administered by a board of seven (7) Directors – Four (4) farmer directors, two (2) public directors, and one (1) County Commissioner. Directors are appointed by a developed list of nominating organizations. Five (5) associate directors are also involved with the functions of the District. Six (6) staff people conduct the day to day operations of the District. The primary goal of the District is the development, improvement and conservation of the County’s soil, water and related resources as well as educating the community in various conservation and environmental practices and methods. It operates with guidance from the State Conservation Commission and other State and Federal agencies.